Chinese Herbalists believe that herbs have specific properties and actions such as warming, cooling, moving, draining, etc. Each herb has particular tastes (sour, bitter, sweet, bland, spicy, neutral), and each herb goes to specific organs. Herbs are combined to create balance in the body through these tastes, temperatures, actions and functions. Warming herbs are used to treat a cold condition. Moving herbs are used to treat a stagnant condition. Cooling herbs are used to treat a hot condition. Sweet herbs are nourishing and tonifying, and are used to treat deficient conditions. Bland herbs tend to be diuretic and are used to drain dampness. Bitter herbs tend to be cold and draining, and are used to relieve hot, toxic conditions like infections. In addition to their properties, tastes, and temperatures, herbs have pharmacological actions. Modern herbalists are beginning to research the active ingredients in herbs and determine the reasons for their actions in western terms. Many herbs with the bitter taste have anti-viral, anti-fungal or anti-bacterial actions. Some herbs, such as licorice or ginseng can effect the heart rate. 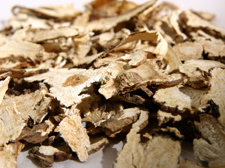 Some, such as astragalus, boost the immune system or are anti-carcinogenic. Pharmaceutical agents also have tastes, temperatures and properties, but Western practitioners are trained to use them based on their pharmacological actions rather than their tastes and properties. Antibiotics are similar to bitter herbs — cold in nature, draining, and able to clear toxic heat (infection). In Chinese Medicine, the symptom of sore throat is an indication of heat in the lung system. The heat may be caused by an excess of heat or a deficiency of cooling yin, and may be from a source internal to the patient's body or due to a pathogenic influence from the outside. If a patient comes to an herbalist with a sore throat, the herbalist would evaluate the patient to determine the type and cause of sore throat. The herbs in the formula would vary based on the constitution of the patient and the source of the heat. 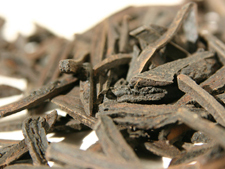 The first step to choosing a Chinese herb formula is the evaluation. The process is identical to the one described in the TCM Diagnosis section of this site and involves looking, asking, touching, and listening. Based on all the information gathered during the evaluation, a Chinese medical diagnosis will be made. Herbal formulas are chosen based on this diagnosis. It is rare for a Chinese herbalist to give a patient a single herb. Classical formulas contain from one to over twenty ingredients, and are custom blended to the patient's specific condition. If you were seeing an herbalist in China, you would likely leave her office with a bag of twigs, leaves, minerals, branches, roots, etc. You would need to boil them in water to make a tea which would be drunk several times per day. You would return to the herbalist every few days to re-evaluate your condition, and your formula would be changed as your condition changed. When your acute condition is better, you would be given a “constitutional” formula to take for a longer period of time to help keep you from getting sick again. In America, patients are not accustomed to boiling their medicines and drinking strange tasting teas as patients in China are. There is concern about whether the raw plant material can be correctly identified by the herbalist and whether the amount of active ingredients is standardized between batches of formulas. For these reasons, many herbalists in the US utilize herb formulas in pill, capsule, granule or liquid extract form. The manufacturer obtains the raw materials and chromatography studies are done to ensure the correct herb species and to confirm that each batch of a formula contains the same ingredients. Herbs are packaged in sealed containers, and are tested for contaminants, pesticides, pharmaceutical agents and other things you wouldn't want to have in your formula. The herbalist customizes the patient's formula by providing combinations of prepared formulas to get as close as possible to what would be given if creating a formula from scratch. When you receive a bottle of Chinese herbs from us, you may notice that some of the bottles contain a warning label indicating that “This product may contain chemicals known to the State of California to cause cancer or birth defects”. We want you to know that our products are safe and effective and are very unlikely to cause you harm. This label is required by California Proposition 65 on any product not otherwise regulated by the FDA where the levels of some 250 chemicals exceed the state's definition of “no significant risk”, or on any product where the manufacturer is unable to prove that the product does not exceed the thresholds. This proposition was initially instituted to ensure clean drinking water for the State of California, but has been widely construed to require warnings on nearly everything (e.g. in parking garages, hospitals, and on many products). Chinese herbs are plant, animal and mineral products whose raw materials are generally grown and/or produced in China. Any plant will pick up impurities from the soil and from the air. For example, it is the mineral content of soil which accounts for some of the variation in flavors of wines and teas. Many plant products are grown with chemical pesticides and fertilizers, most of which are on the Proposition 65 list. Heavy metals and chemical elements which may be harmful occur in nature, and may be present in the air and soil in which plants are grown. All plant products brought into the US must be fumigated by either chemical fumigation, irradiation, or vacuum sealing, some of which can add trace amounts of chemicals to the product. The Australian and German governments have set standards for “safe” levels of a variety of chemicals which are commonly found in herbal products. The US has set standards for pharmaceutical products, but has no specific regulations for herbal products which are regulated as dietary supplements. Proposition 65 applies to any product which is not otherwise regulated by the US federal government, and sets the “no significant risk” standard considerably lower than the Australian or German herbal standards. If a product contains any of the chemicals on the Proposition 65 list and it is contained in an amount higher than California's threshold for labeling or the manufacturer can't prove that it does not contain less than this amount, the product requires a label. The threshold amount for known carcinogens is considered to be the “no significant risk” level. This is defined as “the level which is calculated to result in not more than one excess case of cancer in 100,000 individuals so exposed over a 70 year lifetime”. Put another way, if you are exposed to the chemical in question at this level every day for 70 years, theoretically it will increase your chances of getting cancer by no more than 1 case in 100,000 individuals so exposed. For chemicals listed as reproductive toxins, the “no significant risk” level is defined as the level of exposure which, even if multiplied by 1000, will not produce birth defects or other reproductive harm. Said another way, this level is 1/1000th of the “no observable effect” level. Based on this standard, virtually any fruits and vegetables you consume would require a label if they were not otherwise regulated by the Federal Government. The reality is that you will not be consuming these herbs daily for 70 years, and even if you were, the likelihood of cancer or birth defects would be less than .01%. It should be noted that Proposition 65 DOES NOT require a product to BE safe nor does it create safety standards for any industry. It simply requires that products carry a warning label if the manufacturer can't prove that they do not exceed the “no significant risk” level. There is no guarantee that a product which is not labeled is safe. Products without labels may have been tested and proven to be below the no significant risk level, or they contain significantly more than the no significant risk level but be manufactured by an industry which is exempt from the labeling requirements (for example, foods and pharmaceuticals which have other FDA mandated regulatory standards). A product with a label may be very safe but untested, or may have been tested and known to contain amounts far exceeding the no significant harm level. There is simply no way to tell. Eastern Body Therapy obtains our herbal products from reputable companies who manufacture their products in GMP certified facilities. (That being said, please note that the US has historically had no GMP standards for herbal products. A GMP standard has recently been developed for dietary supplements and may be found at www.accessdata.fda.gov/scripts/oc/ohrms/index.cfm. (Enter docket number 96N-0417). The final ruling goes into effect in June 2010 for companies with fewer than 20 employees. The GMP standards being used by factories producing herbal products are either the German or Australian standards which are utilized by other countries regulating the production of herbal products.). Where possible, we use organic herbal products. Our manufacturers have been working on batch testing their products and the companies within California have begun specific testing for the chemicals on the Proposition 65 list. All of the products we sell fall below the thresholds for the Australian and German standards, but some exceed California's standards for Proposition 65 labeling. All of our manufacturers can provide material safety data sheets for their products as well as chromatography studies of the contents of their products. We make every effort to ensure that our products are not adulterated with heavy metals, pharmaceutical agents, endangered species of plants or animals, or other toxic substances. Many herbs look alike, and the companies we work with utilize chemical analysis to verify that the herbs they are using are the appropriate species.